Home Politics Will new packaging convince Baton Rouge voters to approve MovEBR? Will new packaging convince Baton Rouge voters to approve MovEBR? 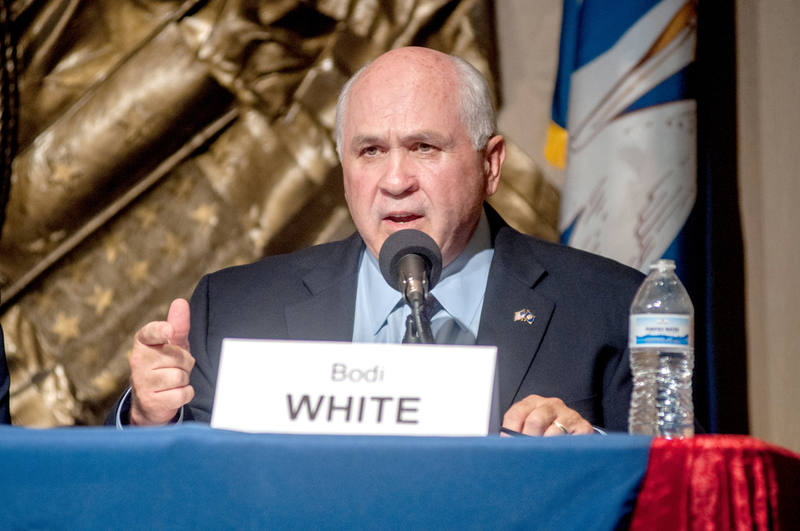 On a Wednesday night in early August, local businessmen Jeff Koonce and Mike Wampold found themselves somewhere they probably never expected to be: attending a meeting of the East Baton Rouge Metro Council to support a tax proposal. Koonce, general counsel of Bernhard Capital Partners and a tax attorney by trade, stepped up to the podium to speak in favor of Mayor Sharon Weston Broome’s MovEBR roads tax plan, a 30-year, half-cent sales tax that would generate nearly $1 billion for major infrastructure improvements. Baton Rouge’s daily traffic nightmare had finally become too much to bear, prompting fed up businessmen like Wampold, a local developer, as well as Koonce and Jim Bernhard—who founded The Shaw Group and now heads up BCP—to throw their public support behind one of the most ambitious roads tax plans in city-parish history. And they didn’t stop there. After the council voted to send MovEBR to the Dec. 8 ballot, Wampold and Bernhard vowed to fund an informational campaign in support of the roads tax, which is expected to launch after the Nov. 6 election. Perhaps most intriguing are the two political masterminds spearheading the effort from opposites sides of the aisle: Prolific GOP fundraiser Allee Bautsch Grunewald and nationally recognized Democratic consultant Michael Beychok. Grunewald, the more surprising of the two, agreed to come on board when Wampold, a friend, reached out to her. Traditionally, that is true. Infrastructure has long been regarded as a nonpartisan issue, one of the rare areas of politics that all sides could get behind. But recent history tells a different story, especially in East Baton Rouge. 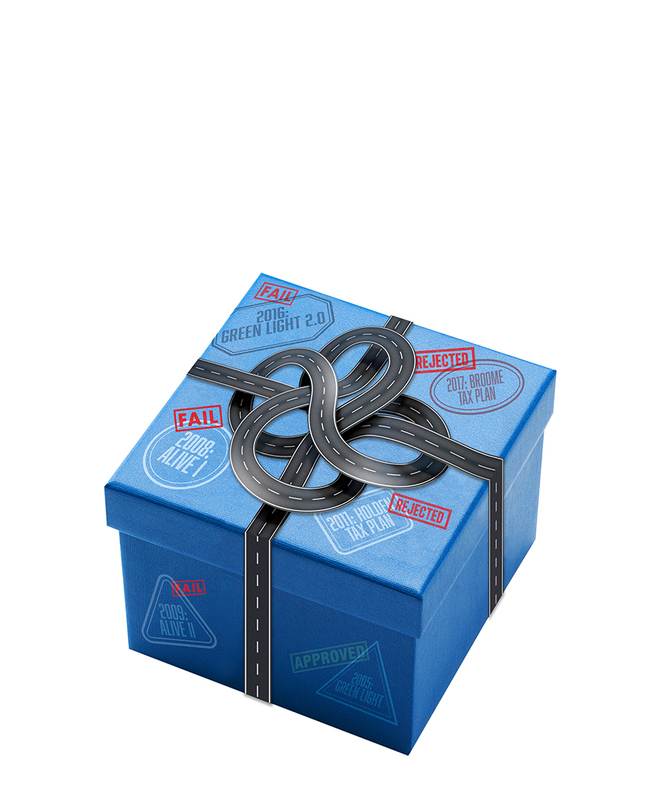 Several roads tax pitches have failed over the past decade (See timeline graphic). 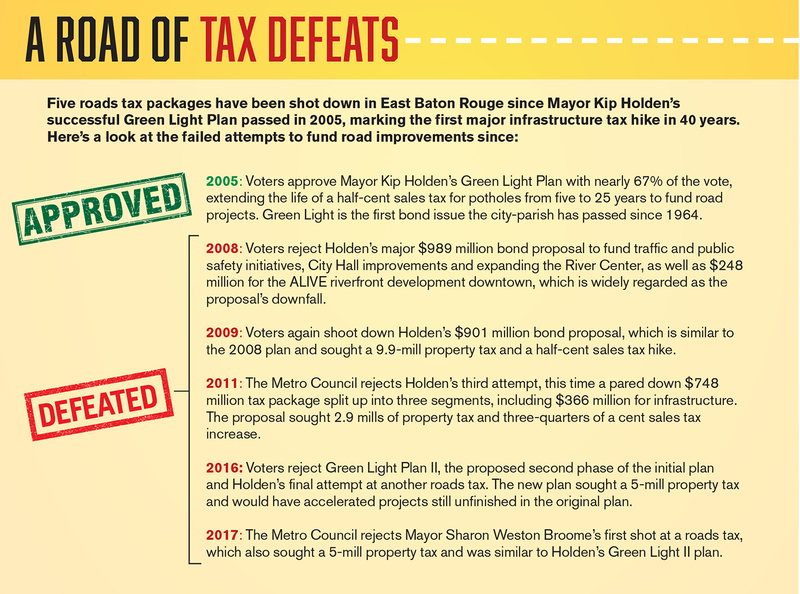 Former Mayor Kip Holden’s Green Light Plan was the last to succeed in 2005, and the only one in more than 50 years. The opposition stems from a growing public distrust, as voters have become increasingly frustrated with what they see as high taxes, unbridled city-parish spending and little to show for it—other than high crime, low-performing schools and traffic. 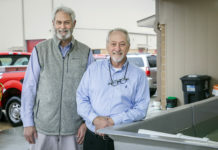 The sentiment has flourished in the more conservative southeast portion of the parish, fueling the St. George incorporation effort, where opposition to taxes rings loudest. 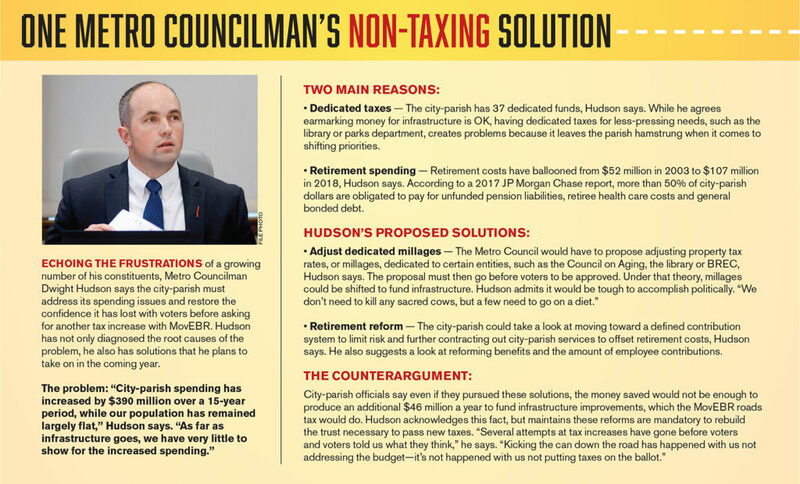 Nearly everyone agrees road upgrades are badly needed, yet at the same time an anti-tax crusade has been mounted, driven by controversial tax hikes in recent years such as ones for CATS and the Council on Aging, diminishing hope of getting any other measures passed. MovEBR supporters would argue, though, this tax is not like others. The plan has been tweaked from previous attempts, says the mayor’s administration, and is driven by data, public input and business community support. Another difference is that MovEBR is a half-cent sales tax, whereas Broome’s last effort was a 5-mill property tax, which the Metro Council refused to place on the ballot. The mayor says public feedback prompted the switch to a sales tax, which, though regarded as regressive, is viewed as more equitable among conservatives because, unlike property taxes, everyone pays. Also, the sales tax would not apply to groceries, prescriptions or utilities. 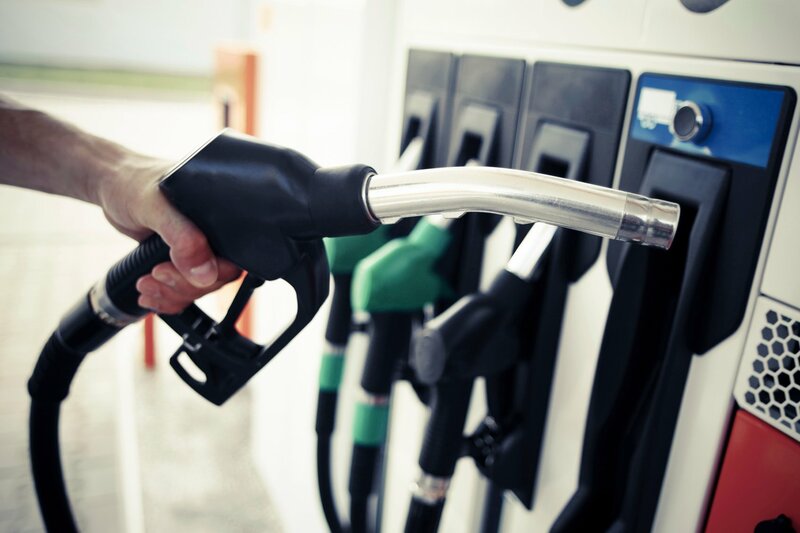 Another benefit is that an estimated 21% of the sales tax collected will come from outside the parish, as people who travel to Baton Rouge for work, events or shopping will also be paying the tax for better roads. That number comes from LSU economist Stephen Barnes, who conducted an analysis on the mayor’s MovEBR plan, which found the long-term benefits of the infrastructure upgrades far outweigh the cost of the sales tax. Those findings were presented by Barnes to the Metro Council and have been touted by the administration at community meetings. Will passage of MovEBR make it easier to solve 1-10 traffic woes? Fred Raiford, director of the Department of Transportation and Drainage, has been to more than 40 community meetings to discuss the MovEBR plan, often flanked by the mayor, Assistant CAO Rowdy Gaudet and CAO Darryl Gissel. The response has been positive. 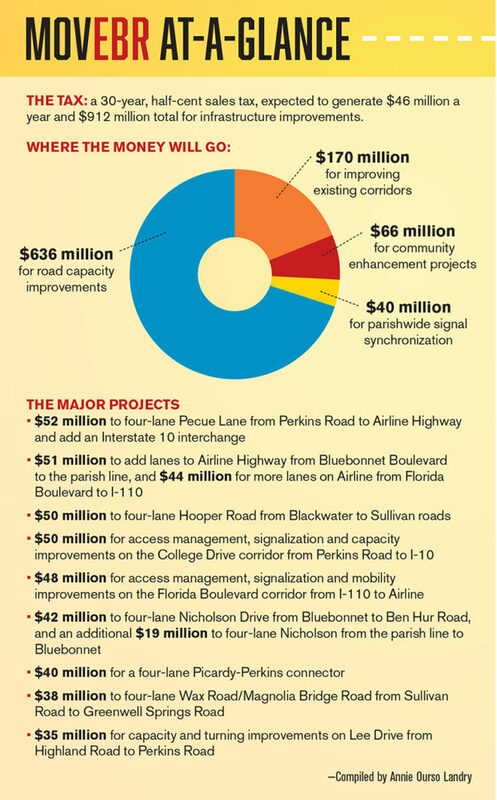 Most approve of MovEBR’s ambitious list of more than 60 road projects to be funded by the dedicated tax, along with parishwide signal synchronization and community enhancement projects. Even Hudson says it’s a “good plan with projects selected using good data,” which he says is encouraging, even though he won’t vote for the tax until the city-parish faces its budget issues. 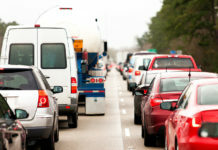 Local business groups like the Baton Rouge Area Chamber and the Capital Region Industry for Sustainable Infrastructure Solutions, or CRISIS, have come out in support of MovEBR as well. The plan does have some public detractors, though, such as local architect Coleman Brown, the infrastructure chair of the East Baton Rouge Chamber of Commerce. Brown argues half the roads in MovEBR are state owned and should be paid for by the state. 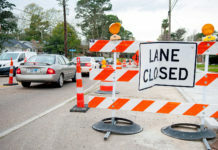 Raiford counters that the parish cannot wait on the state to fix its traffic issues, and it’s not uncommon for local government to fund improvements of state roads in their area. There are also questions about bond sales, which the city-parish plans to issue in order to expedite funding for MovEBR projects. Green Light was also partially funded by bonds. The Broome administration expects to bond about 40% of the MovEBR projects, or about $376 million, at an estimated 5% interest rate—though that rate may be lower. “It’s a very conservative approach,” says Gordon King of Government Consultants Inc., which advises the parish. The remaining 60% of projects, amounting to $607 million, will be pay-as-you-go, meaning they will be funded as the annual tax collections are received. Raiford says the city-parish is pursuing bonds because the road projects are massive. For instance, the proposed Pecue Lane expansion and I-10 interchange alone costs $50 million. If MovEBR were pay-as-you-go, generating $46 million a year, it could take one whole year to fund just one project. Another reason the MovEBR plan stands out is because of the team of support behind it, particularly from the business community, and the soon-to-be-released informational campaign aimed at getting the roads tax passed. Business leaders and consultants are tight-lipped on details of the campaign so far. They have not disclosed how much money has been donated to support the cause. Beychok and Grunewald say polling has been done, which has been very favorable, but the results will not be released. “It was encouraging enough to get investments from people who believe (MoveEBR) can pass,” Beychok says. Business leaders like Bernhard have said the campaign will inform voters on exactly where their tax money will go, which roads will be improved and why this is not just another tax. Wampold adds that voters can expect the traditional campaign material, such as television, radio and billboard ads, as well as mailers. And Wampold himself has been campaigning very publicly for the roads tax. 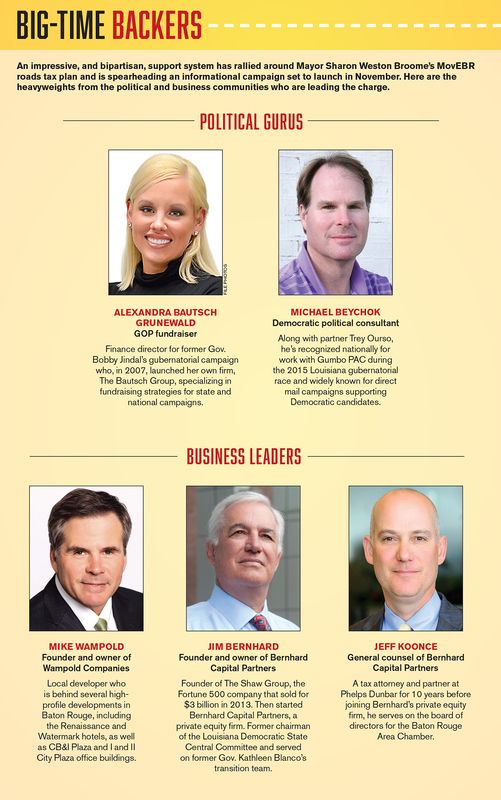 Longtime political experts, who are not involved in the MovEBR campaign, say having business support is important, and an informational campaign will be helpful, but they have to get the messaging right. But Pinsonat has other reservations about MovEBR. Voter turnout will be crucial, he says, requiring a decent amount of African-American and Democratic voters if MovEBR is to pass. The prospects of that happening don’t look good. The Dec. 8 ballot is not expected to draw a large turnout, which typically means it will be more chronic voters, who are white, older and often anti-tax. Also, the ballot has two tax proposals: MovEBR and the property tax for the Bridge Center mental health facility. Roy Fletcher, another longtime Baton Rouge political consultant, echoes Pinsonat’s concerns about voter turnout, but he seems a bit more hopeful about MovEBR’s chances. It all boils down to political dynamics, he says, not just of voter turnout, but of how the supporters will put together their campaign and get the word out. As always, Fletcher cautions that, “A tax is a tax is a tax,” and because of that, MovEBR has built-in opposition. Like Hudson, Fletcher says overcoming such opposition takes one thing: Trust. And that’s something the mayor and her administration struggled with in her tumultuous first year in office.